Union claims important victory in new 4-and-a-half year contract with city’s largest private hospital. Compromises made on some wage issues. Above: Service and technical workers at Hopkins Hospital staged a three-day strike in April. 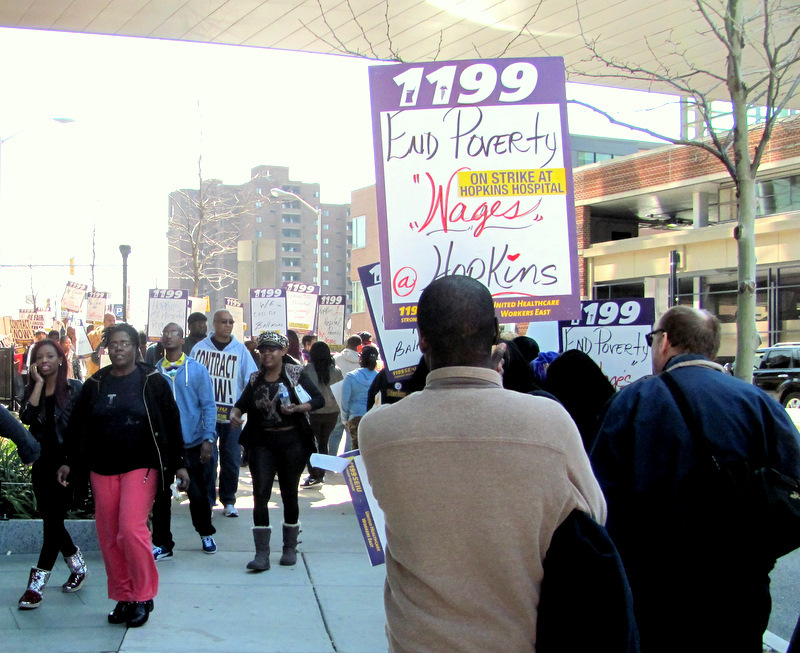 Agreeing to increase the wages of its lowest-paid workers, Johns Hopkins Hospital has reached a tentative agreement with 1199SEIU, The Brew has learned. After months of tense negotiations and under the threat of a second strike, the hospital agreed to a $14.50-an-hour minimum wage for workers with 15 years of experience next year, according to union spokesman Jim McNeill. This is less than a $15 minimum “floor” sought by the union, but significantly more than the 1.5% wage increase previously offered by hospital management, McNeill said. The parties reached an agreement at 2 a.m. this morning following an evening of negotiations that followed Maryland Gov. Martin O’Malley’s call for a “cooling-off” period. The union contended that Baltimore’s largest private hospital so underpays its workers that many had to rely on food stamps, Medicaid and other public assistance to make ends meet. The union held a three-day strike in April, a mass rally in the Inner Harbor in May and had scheduled a four-day strike late last month. The second strike was called off after Maryland Gov. Martin O’Malley asked both parties on June 27 to agree to a one-week cooling-off period. Opting against a strike over the Fourth of July weekend, the union met with management for talks beginning at 5 p.m. yesterday. Union members are scheduled to vote on the 4½-year contract this Thursday and Friday. • A boost of as much as $4.30 an hour over the life of the contract for Hopkins’ lowest-paid workers. • Current workers will make at least $13 an hour by 2018 – or $1 more than previously offered by Hopkins – and workers with 15 years of experience will earn $15 an hour or more by that year. • Across-the-board raises of at least 2% every year, with a 0.5% bonus in the first year of the contract and a 2.75% raise in 2017. • An agreement to establish a committee to review market rates for surgical techs, pharmacy techs and other workers, whose pay the union contends, is under market.